These rum and raisin cupcakes are a delicious, but rather boozy bake. They’re reminiscent of Old Jamaica, a chocolate rum and raisin flavoured bar from my childhood. I used to save up my pocket money so I could occasionally indulge in what seemed to be a highly sophisticated treat at the time. I have a jar of raisins soaking in rum permanently on the go, but as the jar hides at the back of the cupboard, I keep forgetting about it. When I saw a recipe for rum and raisin cupcakes in Primrose Bakery Christmas, I was instantly reminded of it. This was the 4th bake for a friend’s event two years ago. I’ve just discovered the post in my draft folder – I think I may have a few more. Luckily I wrote the recipe down at the time, or it would remain forever forgotten. I’ve already posted about the mini chocolate surprise cakes, the dairy and gluten free lemon and almond coconut cakes and the apple crumble cakes with custard buttercream that I also baked for the event. For these rum and raison cupcakes, I used my standard mini cupcake recipe. It has stood the test of time. In true cupcake style, the cakes are topped with buttercream, but a buttercream doused in rum. For this reason, it’s probably best to keep these cakes as adult only fare. All of the cakes went down very well, but I do remember that these were a particular favourite. Boozy mini cakes reminiscent of Old Jamaica, a chocolate rum and raisin bar which seemed highly sophisticated at the time. Topped with rum buttercream, they are best left to the adults. 100 g raisins soaked in 50 ml of dark rum or more for as long as possible. Beat in the eggs, one at a time together with the vanilla extract and salt. Sift in the flour and gently stir until just mixed. Drain the raisins and stir in the rum, followed by the raisins themselves (reserving 24 for decorating purposes). Beat the butter together with half the sugar. Beat in the rum, then the remaining sugar. Continue to beat until lightly whipped, then spread over the cakes. Top with a rum soaked raisin. Makes 24 mini cupcakes or 12 large ones. 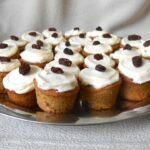 I’m sharing these mini rum and raisin cupcakes with Treat Petite over at The Baking Explorer. The bakes also go to Bake of the Week with Mummy Mishaps and Casa Costello. And I’m also sending them to #CookBlogShare which is with Easy Peasy Foodie this week. Thanks for taking a look at Tin and Thyme. If you make these rum and raisin cupcakes, I’d love to hear about it in the comments below or via social media. Do share a photo on social media too and use the hashtag #tinandthyme, so I can spot it. For more delicious and nutritious recipes, follow me on Twitter, Facebook, Instagram or Pinterest. 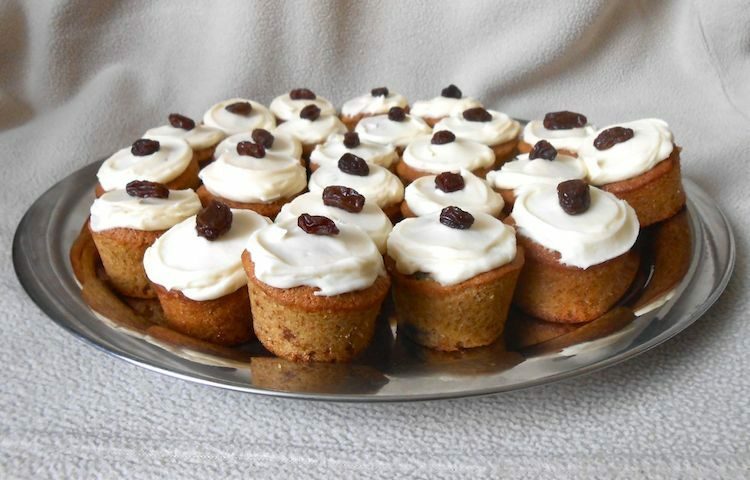 Rum and Raisin Cupcakes. PIN IT. You had me at rum and raisin! These are such an adorable size too! Ooooh. I am so making these. Rum and raisin is The Vikings fave ice cream flavour and he adores old Jamaica too. This is such a win win for me!! Thanks Kat. I obviously missed the new logo. Will head over to have a look. Ooh and aah, love the sound of those cupcakes. Must try your delicious boozy recipe. Oh do Galina and let me know how you get on. Rum and raisin…they remind me of holidays 🙂 These cupcakes look awesome! Why of holidays? Rum and raisin ice cream? That was all the rage in my youth. Oh I just love the sound of these, I love Old Jamaica chocolate also Rum and Raisin ice cream, I think I would be very happy to eat one of your cupcakes. Yes, rum and raisin ice cream. That used to be such a big thing here in Cornwall. Next time I’m out and about and fancy an ice cream, I shall see if they still do it. If I wasn’t cutting back because of last week’s rather indulgent holiday these would be made in a flash. And eaten as quickly! Love this boozy bake, so much to my street in flavours, really love the look of it. Sending to Pete to make! Good luck Kavey. I hope Pete gets the message loud and clear. Those look adorably delicious! We have a few bottles of rum from a caribbean holiday a few years ago, so I will have to put them to good use in these lovely little cakes. Rum and Raisin (Old Jamaica) is such a taste of my childhood – I need to make these! Yes exactly. I heard from someone that they still make Old Jamaica, so I’m determined to search some out for old time’s sake. Thanks Kat. I haven’t made any cupcakes in a very long time, so it was good to get a reminder at how nice they can be. I love that old fashioned combo of rum and raisin and these wee fairy cakes look so tasty! Hahaha, I can see the temptation indeed, but they tend to live at the back of the cupboard and get forgotten about, otherwise the raisins could be in danger.